Dozens of pianists have completed a 22-hour musical marathon by playing a rare, full-length performance of French composer Erik Satie's Vexations. The short piece was performed 840 times in a row as part of the Cheltenham Music Festival to celebrate the 150th anniversary of the composer's birth. Visitors to St Paul's Church in the town even brought along sleeping bags for the feat of musical endurance. The marathon began at midday on Friday and finished on Saturday morning. The single page of music was written by a distraught Satie in 1893 following a split from his one and only girlfriend. The instructions for the performance, were that it should be played 840 times non-stop, extremely slowly. 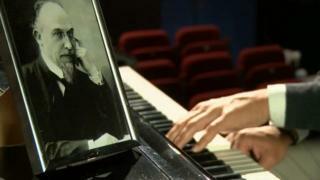 But festival director, Meurig Bowen, said Satie "probably never intended that it should be performed". "It wasn't performed in his lifetime," he said. "It was performed in New York the first time in 1963. It was organised by John Cage and Andy Warhol was in the audience." Among the pianists who took part at the keyboard in Cheltenham was Florian Kaplick, who flew in from Scotland especially. "I could never play Vexations in a full cycle and when I heard that this was going to happen - I wanted to be part of it," he said. Another of the 35 pianists, who took part in the marathon musical relay was actor and comedian Alastair McGowan. "You're aware you're doing the same thing for half an hour and sometimes you're doing them and you're thinking have I gone back to the first bit or the second bit - you really cannot remember where you are," he said. "But if you can't remember you hope the audience can't remember either."